The trouble kicked off following a sectarian parade to mark ‘the mini Twelfth’, and saw a return of serious rioting in the area, less than two weeks after major disturbances in east Belfast made international headlines. In the hours after a parade by the Orange Order involving thousands of loyalists, groups of parade supporters began attacking Catholics in the area. The main trouble began with an incursion into Mountpottinger Road by a loyalist mob. The loyalists beat up a local Catholic man and then attacked a number of homes. As desperate hand-to-hand fighting again broke out in the besieged Short Strand, another local man was attacked by the PSNI police. Full-scale rioting ensued. Petrol bombs were thrown before the PSNI arrived in numbers and pushed loyalist rioters east, up Castlereagh Street. Water cannon were also briefly deployed as rioting continued into the early hours of the morning. Two weeks ago, the violence in the area was described as the worst seen in over a decade. Over two nights, the unionist paramilitary UVF launched a brazen, all-out assault on the Catholic enclave, opening fire on St Matthew’s church. Only the actions of local republicans prevented the besieged community from being overrun by masked paramilitaries from the surrounding loyalist estates. The extent of UVF involvement in Friday night’s violence is still unclear. Talks involving government officials and the local UVF commander -- known only as ‘the Beast of the East’ -- have centred on the distribution of so-called ‘peace funds’ to UVF front organisations. The 26-County President Mary McAleese, and her husband Martin -- a prominent figure in efforts to provide millions of pounds to UVF-linked groups in the area -- visited east Belfast on Wednesday as part of the effort by the Dublin and London governments to seal a new ‘cash for peace’ deal. 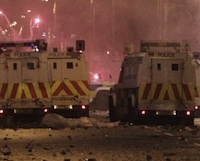 The talks were thought to have succeeded in ending the violence in east Belfast. However, the UVF has also threatened to create “a Short Strand situation” in the affluent North Down town of Bangor, according to reports. The Red Hand Commando, a cover name for the UVF, says its members and supporters will riot on the streets of the predominately Protestant town if a list of demands, including a substantial cash payment, aren’t met by North Down Council. UVF groups in other areas of the North are said to be making similar demands. On Saturday, the PSNI played down UVF involvement in Friday night’s clashes, and blamed them instead on sectarianism linked to the anti-Catholic Orange Order. The Orange march on Friday night was one of scores taking place across the North for the ‘mini Twelfth’, and heaped tensions on the already difficult situation in east Belfast. Earlier on Friday, nationalists were stunned when the most controversial Orange Order parade of the marching season was given the go-ahead to proceed past a nationalist part of north Belfast on 12 July — the scene of major clashes last summer. The North’s Parades Commission gave the Orangemen permission to parade by the Ardoyne shop fronts for ‘the Twelfth’, albeit with restrictions. The parade is to mark the Battle of the Boyne, a 17th century Protestant battle victory, and represents the height of the Protestant marching season. The Commission’s decision this year not to reroute the parade is the same as last year, with the same restrictions on bands and the numbers of loyalists involved. Last year, nationalist protests led to four days of rioting in Ardoyne with petrol bombs, bricks and other missiles were thrown at the PSNI during the disorder. Scores of nationalists were arrested then, in sharp contrast to the PSNI’s handling of the recent loyalist assault on the Short Strand. Sinn Fein assembly member Gerry Kelly said he was “baffled” by the Commission’s decision. “The Parades Commission only two weeks ago stopped an Orange Order march past Ardoyne, Mountainview and the Dales,” he said. “Nothing has changed since then so why they have allowed this march to go ahead twice on the Twelfth of July bears no logic and is extremely disappointing. “There is a need for dialogue around this issue. Each year it is sought, the residents of these areas are ready and willing to engage, yet the Orange Order refuse to embark on meaningful talks. “This needs to happen in order to reach a resolution to this long running issue that comes around each year.